Melton Day Nursery. Recognised as Outstanding by the Ofstead, the Melton Day Nursery is a day nursery for children up to school age. Located in a purpose-built building, the nursery is especially proud of its outstanding facilities which among others also include a swimming pool. Melton Under Five's Pre-School. Many of the village's youngest residents also attend the Melton Under Five’s Pre-School which, like its name suggests, is intended for children up to school age. Operating in Melton for more than two and a half decades, this Pre-School has recently relocated into a brand new purpose-built grounds. It accepts only 25 children at a time in order to keep its child-staff ratio low. St Andrew's Parent and Toddler Group. Run by the Church of St Andrew the Apostle, the group welcomes pre-school children and their parents (and grandparents) every Monday afternoon. On group meetings, parents/grandparents and their little ones create arts and crafts, play, sing, dance and wealth of other fun and exciting things. Keep in mind, however, that there are no group meeting during August. Ipswich Mini Melodies. This private music school for pre-school children is run and owned by Jill King who helps Melton's youngest residents discover and experience music. Operating Ipswich Mini Melodies for almost a decade, Jill also works as a music teacher at the Cedarwood Primary School in Kesgrave. She teaches music not only in Melton but other nurseries in and near Ipswich as well but she is also available for private lessons. Melton Primary School. The village's school age children attend the Melton Primary School which is owned and operated by the County Council. The school's mission is to ensure that every child has equal access to learning opportunities and high quality education, and at the same time, create an academically challenging but intellectually stimulating environment. 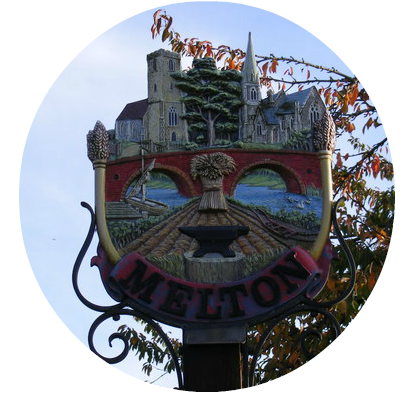 There are no secondary schools and further education institutions in Melton. After completing primary school, children thus have to continue education outside their village. Most of them enrol in Farlingaye High School in Woodbridge but some parents also decide to send their youngsters to independent schools such as Alexander College and Woodbridge School, both of which are located in Woodbridge as well.